Drake "Degrassi" Reunion!? ~ Phresh Hott New! 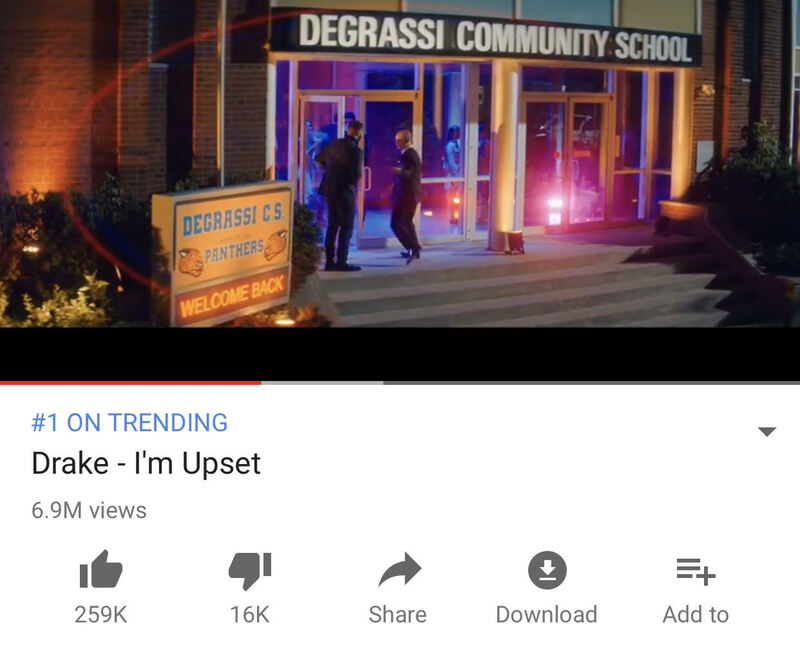 Drake reunites with ‘Degrassi’ cast in his new music video for “I’m Upset.” It’s been over a decade seen Drake aka Jimmy Brooks graduated from Degrassi High School. In his new music video for “I’m Upset” Drake returns to his former high school. Video directed by Karena Evans who also work on “Nice for What”, directed Drake reuniting with his classmates from “Degrassi: The Next Generation” for one big party in the sentimental clip. Let’s break it down. In the beginning of the scene, Drake is waking up with a girl next to him to a reminder on his phone about the high school reunion. While getting up his on the floor of the Air Canada Centre, home of the Toronto Raptors. Now after getting the reminder on his phone, he is at the tailor getting fitted, while that’s happened pops up his cast mate Shane Kipped. And together they take off in a yellow LA Ferrari before heading to Degrassi Community School for the Class of 2007 reunion. As Drake “Jimmy” and Shane Kipped pulled up, cast mate Nina Dobrey, Stacey Farber, Jake Epstein, and A.J. Saudin dance in the halls, while Drake “Jimmy” takes selfies with the ladies. Also you will see a return appearance from Jay and Silent Bob (Jason Mewes and Kevin Smith) as the delivered weed to the principal (Stefan Brogren). In the end the “Degrassi” cast party it up a little too hard and there’s puking, fighting, and a make-out session in the bathroom. Plus with a visit from the fire department. Click PLAY below & Watch! Leave a comment or rate your opinion! Tell us what you think?